Trincomalee GH Medical Superintendent Dr (Mrs.) P.Gnangunalan said at the event that the commissioning of the surgical unit with central air-conditioning plant covering Intensive Care Unit and Special ward for Baby Care Unit was a milestone in the development of the Trinco GH and would provide better medical facilities to the people. Provincial Director of Health Services Dr.V.Kumaravetpillai said Trincomalee GH was provided with air-conditioning facilities with the assistance of Italian government ten years ago .The hospital suffered when the air-conditioning plant broke down. Now the hospital has been provided with a modern central air-conditioning plant. 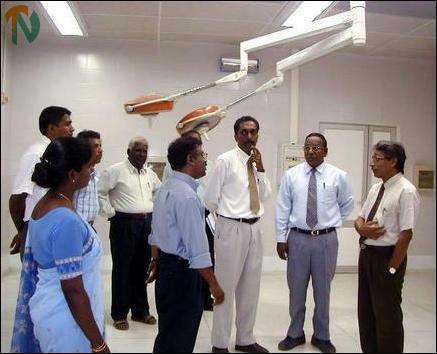 "Base hospitals in Trincomalee, Vavuniya and Mannar have been upgraded to general hospitals. However, these medical institutions are called general hospitals only in name. But they have not been provided with modern facilities and other resources that are needed to provide the services expected from general hospitals," said Dr.Kumaravetpillai. Deputy Provincial Director of Health Services Dr.S.Abraham said that he applauded the provincial health ministry for their part in supporting this hospital. Provincial Ministry Secretary Mr.R.M.S.Ratnayake said earlier because of frequent breakdown of the AC system in the hospital surgeons, consultants and medical officers found it difficult to provide better medical attention to patients. With the installation of new modern AC system medical staff would be in a position to provide better services to patients, he said. Trincomalee GH faces many more problems such as shortage of quarters for medical officers and other medical requirements. These needs could be addressed in future with the assistance of the Sri Lanka government, Asian Development Bank and World Bank, Mr. Ratnayake said.